Entertaining a natural fascination with the warfare and weapons of Ancient Greece, we will linger a little while longer on this exciting topic and enjoy a wonderful lineup of interesting guest posts in the next few weeks. Embedded like a hidden gem in last week’s guest post by Richard Vallance Janke, A Mycenaean Chariot in the Knossos Armory, a mention of his colleague Rita Roberts enticed me to pay a visit to her website. What a treat! A retired archaeologist living in Crete, Rita Roberts has my deepest respect and admiration for her wonderful accomplishments in translating ancient Mycenaean Linear B script. Under Richard’s excellent mentorship, Rita completed a diploma in Linear B studies and she is now pursuing an undergraduate degree. Lately working with Linear B tablets from Knossos regarding Mycenaean military affairs, Rita is well on her way to becoming an expert on the subject. The following guest post is her essay comprehensively outlining current knowledge on the topic of Mycenaean chariot construction. 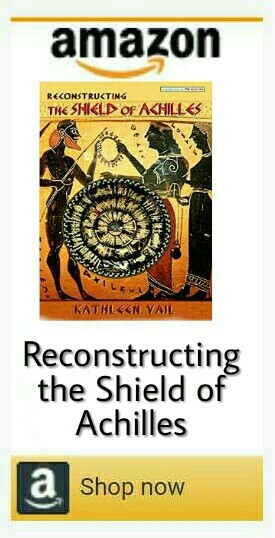 Offering a rich complement in the search for everything related to Achilles and his divine shield, I am very sure we will see more archaeological coverage from Rita here on TheShieldofAchilles.net. within the limits of technology available to them in Mycenaean times. attested to by seal engravings and the Linear B Tablets. wheels and horses are inventoried in several Linear B tablets. the end of the Bronze Age. and, on fewer occasions, as a platform for a bow-armed warrior. seem to have been occurring in the later period. some points differ in other depictions on various other frescoes. to the front of the chariot. rested directly on the axle connecting the two wheels. with wicker wood. The wheels had four to eight spokes. more likely of interwoven raw-hide thongs. seem to be standard throughout this period. –Also see M. Lahanas’ HellenicaWorld.com for another excellent page about Ancient Greek chariots. Thank you so much for this post Kathleen. I am pleased you are so interested and following my progress with the Linear B scripts. Thanks to my teacher Richard Vallance. My pleasure Rita! I really admire your efforts and accomplishments – so interesting and so challenging! The fact that Linear B tablets allowed us to figure out details proves how important and useful those initial ways of writing were, indeed.